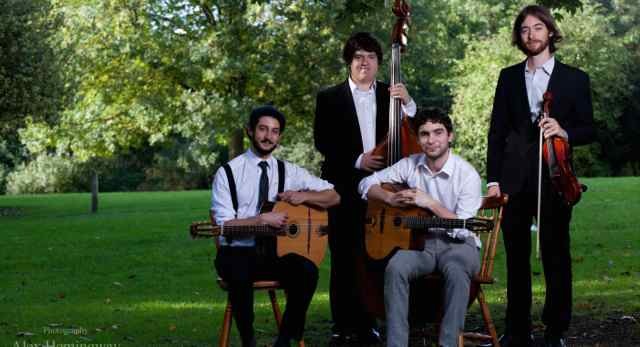 Matt Holborn’s quartet is based in Leeds, so they’re perfect for north-of-England-based jazz themed weddings, corporate functions, private parties and more. They will, however, travel down south and perform – just ask for a quote. They’ve recently performed at the Cafe Consort at The Albert Hall, and notched up appearances at Buckingham Palace, Edinburgh Jazz Festival and Bestival on the Isle of Wight, so it’s clear that travelling to work doesn’t present a problem. 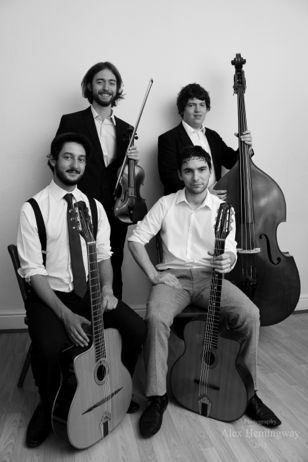 The band’s material includes fresh takes on gypsy jazz classics, swing jazz standards, bebop violin jazz and even some world music. They pay homage to the traditions of jazz, and they’re not afraid to take it in new directions and keep it fresh for the modern listener. Click on the Soundcloud links to the right to hear the band in action – or take a look at the YouTube video – it’ll get your toes tapping.